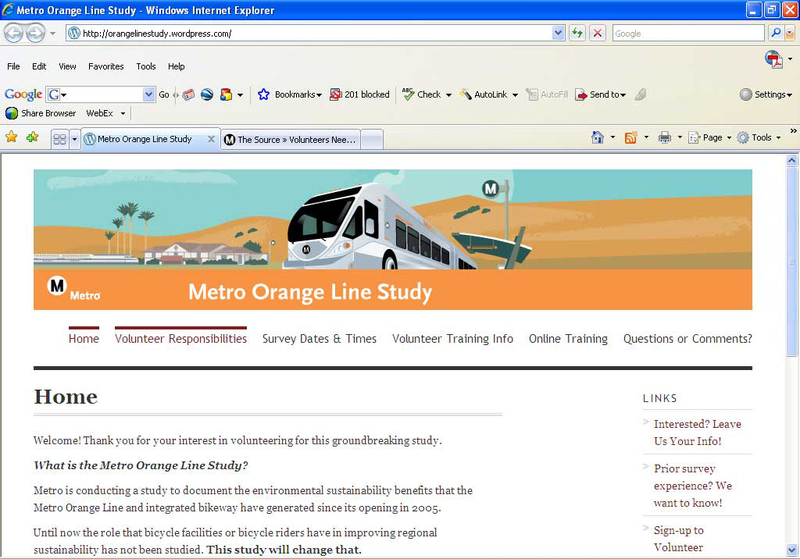 In December, Metro postponed its call for volunteers to do an official bike study on the Valley’s Orange Line – the only bus rapid transit line in the county with its own dedicated bike path. Well, spring has arrived, and this study is now scheduled for the end of March. The goal of the study remains essentially the same as originally conceived late last year. The agency’s Planning and Sustainability departments are trying to determine how, or if, the Orange Line bikeway and bike parking facilities have encouraged alternative travel modes, reduced car usage and reduced greenhouse gas emissions. Volunteers will survey bike riders, walkers and car drivers who utilize Orange Line park-and-ride lots. Two to three volunteers are needed per station. Don’t worry if you don’t know how to survey or do bike counts. Metro will be providing in–person training and orientation for all volunteers. The agency, in fact, is hosting a training session at Pitfire Pizza in North Hollywood Monday, March 22 at 7 p.m. for all pre-registered volunteers. Online training on the web site is also available. Volunteers who sign up on the web site can pick their own station and time. Slots could fill up fast, so signing up early is recommended.